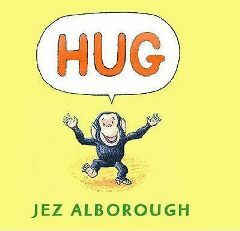 ‘Hug’ is a very interesting picture book by Jez Alborough. When I first read it with my daughter I have to say that I was a little disappointed because in the entire book there are actually only three different words. However, I have since come to realise that that doesn’t stop it being a brilliant little book. Basically it is the story of a little chimp called Bobo who is wandering through the jungle noticing lots of different animals. All these animals are in pairs or more and therefore they each have a friend or a relation to hug! Bobo sees elephants, snakes, chameleons, lions, giraffes, hippos etc. They are always hugging. Every time he comes across a new set of animals he points at them and says ‘HUG!’. However, as time goes on he gradually looks sadder and sadder because he has no one to hug himself! All the animals are starting to be quite concerned about Bobo until finally we see him sitting alone bawling his eyes out (very sad!). All of a sudden there is a loud call – ‘BOBO’ which makes Bobo look up into the trees where he sees ‘MUMMY’. Finally Bobo gets his hug which makes all the other creatures happy as well. There is a nice twist on the final page though as all the animals hug each other, but they don’t just hug their own breed – there are giraffes hugging elephants, chameleons hugging snakes etc. Therefore, although I was initially disappointed with so few words, I now realise that there is a very strong story told through the pictures which gives my daughter the opportunity to tell the story in her own words. There is also so much to discuss – how it feels to be alone, how lovely it is to hug – and even at the end you can touch on how important it is for everyone to get on with each other. The illustrations in this book are excellent which is really important because you have to rely on them to tell the story. All the creatures are very lifelike and the expressions on their faces portray a range of emotions! The colours are wonderful too. This certainly is a warm happy book with lots to talk about. After reading it with me, my little girl goes around demanding lots of hugs from everyone, so one of the best consequences of reading this book is that there are lots of hugs in our house!! « Can’t You Sleep, Little Bear?